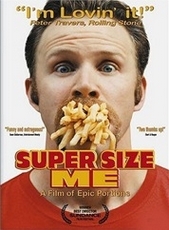 Supersize Me was conceived and filmed by Morgan Spurlock (the guy in this poster) in 2003. For 30 days, he ate nothing but McDonalds’ food, and filmed the consequences. In keeping with the minimalist vibe which has informed the design of all these M&IL resources, I am going to say nothing more about the experiment here: it’s all quite clearly laid out in the movie. Watch it here on YouTube, in full. ( If the YouTube link does not work, please watch the video from Documentary Wire at http://www.documentarywire.com/super-size-me). The film is included in this course for two main reasons. The first is to do with the media literacy element: it is a good general illustration of the way advertising works to persuade us to consume, and how the ‘mass media’ are often complicit in this – indeed, depend on it. The second is more subtle, perhaps, but there are plenty of moments in the movie at which the information that people need in order to make informed choices is either manipulated; concealed; or simply unavailable. The idea of a ‘level playing field’ in the public sphere is revealed to be a myth, and the consequences for public health are, as one speaker in the film states, that we are creating around us a ‘toxic environment, that almost guarantees we will get sick’. Regardless of what you think about McDonalds and its competitors, when watching the movie, try to see for yourselves where these moments occur, and in what different ways. Look also at the ways that Spurlock sets out to validate his experiment, and the conclusions that he draws. Brief notes on your observations will be included as part of your final assessment portfolio. Spurlock’s book, Don’t Eat This Book (2005) is also worth reading, by the way.